Jonathan Paul "Jon" Dorenbos (/ˈdɔːrnbəs/; born July 21, 1980) is an American football long snapper for the Philadelphia Eagles of the National Football League (NFL). He was signed by the Buffalo Bills as an undrafted free agent in 2003. He played college football at the University of Texas at El Paso. Dorenbos has also played for the Tennessee Titans. Dorenbos was a finalist on season 11 of the television program America's Got Talent as a magician. Dorenbos received the "Golden Buzzer" on the first round of judge cuts from guest judge Ne-Yo. He finished in 3rd place for the season. Dorenbos grew up in Woodinville, Washington, and on August 2, 1992, when he was 12, his mother, Kathy, was killed by his father, Alan, a software specialist. His father was charged with and convicted of second-degree murder, and sentenced to 13 years and eight months in prison. Dorenbos was sent to a foster home. After a legal battle, he was adopted by his aunt and uncle, Susan and Steve Hindman. To ease his mind, Dorenbos turned to performing magic. Dorenbos attended Pacifica High School in Garden Grove, California, where he was a letterman in football, basketball, hockey and baseball. He earned all-league honors in football and baseball. He made Dean's list and was an honor roll student in high school. Dorenbos originally attended Golden West College in Huntington Beach, California. During his freshman year, his best friend who was attending University of Texas at El Paso (UTEP), Paul Tessier, called to ask if he would like to be the long snapper for the UTEP Miners football team, which needed one. At the time, Dorenbos was not the long snapper at Golden West; he played linebacker and fullback. He took some video footage from high school, added footage of the Golden West long snapper, and sent it to the coaches at UTEP. He was eventually recruited and became the long snapper for UTEP in 23 games over three seasons. He averaged almost 10 tackles each year at UTEP on punt coverage. Dorenbos earned a business degree from UTEP, with emphasis in economics, finance and marketing. At UTEP's Pro Day workout, in which six teams attended, Dorenbos averaged 0.62 seconds in snapping the ball to the punter. One snap was timed at 0.59 seconds. A good time in the NFL is considered between 0.70 seconds and 0.75 seconds. Then-St. Louis Rams special teams coach Bobby April said of his workout, "Even on tape it's clear the guy is amazing. He's the best I've seen this year. And he might be the best in a lot of years, maybe among the top guys I've ever seen...But I'll tell you, Dorenbos is something else, he really is, man." Dorenbos was personally interviewed by only six teams. After college, Dorenbos was signed as a long snapper by the Buffalo Bills as an undrafted free agent following the 2003 NFL Draft. He was one of only two undrafted free agents to make the team in 2003. He played in his first NFL game on September 7, 2003 against the New England Patriots. He played in all 16 games for the Bills in 2003. In 2004, he led the league in tackles at his position. He played in the first 13 games of the 2004 season before damaging knee ligaments and being placed on the injured reserve list, ending his season. After training camp in 2005, Dorenbos was waived on September 6 during final roster cuts. Dorenbos was signed by the Tennessee Titans on October 26, 2005, the same day he worked out for the team. He played in the last nine games of the 2005 season. He was scheduled to become a restricted free agent in free agency in 2006, but the Titans decided not to offer him a tender. He became an unrestricted free agent on March 3. He was not signed for training camp in 2006, but was re-signed on October 13 by the Titans for an October 15 game against the Washington Redskins. He was released on October 25. Dorenbos was signed to a two-year contract by the Philadelphia Eagles on November 29, 2006 after Mike Bartrum suffered a career-ending neck injury. He played in the last seven games of the 2006 season, including 2 postseason games. He made two special team tackles in 2006. In 2007, he played in all 16 games for the Eagles, and on December 29, 2007, he signed a five-year contract extension that kept him under contract through the 2012 season. He made six total special team tackles in 2007. In 2008, he played in all 16 games for the second-consecutive season. He made five special team tackles in 2008. Dorenbos arrived late to training camp in 2009 after he caught shingles and could not get on an airplane to fly to Lehigh Valley, Pennsylvania, where Eagles training camp was held. He played in all 16 games in 2009, and made four special team tackles. On January 20, 2010, Dorenbos was named to the NFC's Pro Bowl team. On March 11, 2013 he re-signed with the Eagles. On January 16, 2015, Dorenbos was named to his second Pro Bowl team. Following the releases of veterans Trent Cole and Todd Herremans in the 2015 offseason, Dorenbos became the Eagles' longest tenured player. On November 18, 2016, Dorenbos signed a three-year $3.395 million contract extension with the Eagles through 2019. Dorenbos is a professional magician, who has performed in Las Vegas and Hollywood. He collects the autographs of every famous person he performs for on playing cards, which he hangs up in his house in Huntington Beach. He has also performed for former Bills teammates Alex Van Pelt and Jonas Jennings. In 2016, he performed on the eleventh season of America's Got Talent and made it through the auditions with a card trick. In the Judge Cuts round, Dorenbos got the golden buzzer from Ne-Yo and immediately advanced to the next round. In the quarterfinal round of the Live Shows, Dorenbos asked all 4 judges to draw something on paper, predicted which judge drew what, and then a bottle was broken that contained his correct predictions of all of the judges' drawings. In the semifinals, he asked the judges to throw a football at a U.S. map, then revealed 4 quarters from a locked chest whose "tail" sides represented the states hit by the judges footballs. Dorenbos also revealed a hidden map that predicted the locations of the judges' throws. This performance resulted in his advancing to the Top 10 finals on September 13, 2016, where he told an inspirational story while manipulating playing cards that the judges signed. He finished in 3rd place for the season. In the offseason, Dorenbos serves as a corporate motivational speaker and has spoken for companies such as the National FFA Organization, Pioneer Investments, Jackson Hewitt and ING Group. He is the executive producer of an album called Stripped Down with singer Steve Carlson, who is also his best friend. Dorenbos started his own business in Buffalo, New York called DAC Framing. He works with several charities, including Brian Moorman's "Punt Foundation," which helps children with terminal diseases, and Garth Brooks' "Teammates for Kids". Dorenbos is the host of Inside the Eagles, which airs on Eagles Television Network. In 2009, he won a Mid Atlantic Emmy Award for his performances. Dorenbos's sister, Kristina, works in the pharmacology department at Creighton University School of Medicine. His brother, Randy, is an independent contractor. Randy also owns "RAD Remodeling" in Southern California and Cleveland, Ohio. 1 2 3 Coffey, Wayne (August 24, 2003). "MAGIC MAN Bills' Jon Dorenbos overcomes tragedy with a few tricks of the trade". New York Daily News. Retrieved 2009-12-25. 1 2 3 4 Pasquarelli, Len (April 26, 2003). "Dorenbos rises from tragedy". ESPN.com. Retrieved 2009-12-24. 1 2 3 4 5 "Jon Dorenbos". PhiladelphiaEagles.com. Retrieved 2009-12-25. 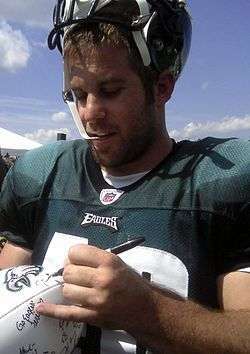 1 2 "#46 Jon Dorenbos Long Snapper". PhiladelphiaEagles.com. Retrieved 2009-12-25. ↑ McPherson, Chris (November 29, 2006). "Eagles Sign LS Dorenbos". Philadelphiaeagles.com. Retrieved 2010-04-11. ↑ "Eagles give long snapper Dorenbos 5-year extension". USA Today. December 29, 2007. Retrieved 2010-04-11. ↑ Bowen, Les (July 27, 2009). "Eagles eye mid-August returns for Abiamiri, Westbrook". Philadelphia Daily News. Archived from the original on July 31, 2009. Retrieved 2009-12-25. ↑ McCue, Ian (May 15, 2015). "Five longest-tenured Philadelphia Eagles players". 247 Sports. Retrieved 2016-09-17. ↑ McPherson, Chris (November 18, 2016). "An Encore: Jon Dorenbos Gets New Contract". PhiladelphiaEagles.com. ↑ Gantt, Darin (June 21, 2016). "Eagles long snapper to display his other talent on NBC tonight". Profootballtalk.com. Retrieved June 21, 2016. ↑ Davenport, Turrah (July 12, 2016). "Jon Dorenbos moves on to live rounds of America's Got Talent". USA Today. Retrieved July 12, 2016. ↑ "Have you watched this mind-blowing America's Got Talent magic trick yet?". News24. July 2, 2016. Retrieved July 2, 2016.